Stewardship means giving back FIRST to God. E-Giving makes this simple. 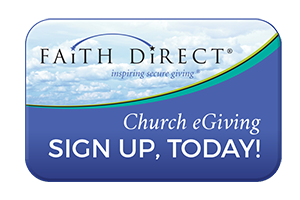 You can access Faith Direct by selecting the "DONATE" button in the header above. Please open to learn about Other Planned Giving Opportunities. We invite you to make a financial commitment to our parish through Faith Direct, which enables you to make contributions to our church by means of direct debit from your checking/savings account or through your credit/debit card. In less than five minutes, I was able to establish my online account with Faith Direct and have begun making recurring monthly gifts to our parish. 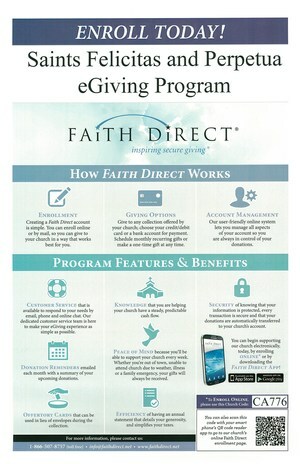 Please join me in enrolling with Faith Direct. May God bless you for your goodness! PS - You can also download a Mobile App through Google Play or the Apple App Store. If you do so, our Church Code is CA776. If you are 70 ½ or older, you can make a tax-free gift directly from your IRA account to SSFP. This law allows you to transfer any amount up to $100,000 annually directly to a qualified charitable organization without paying income tax on the distribution. The transfer does not generate taxable income or a tax deduction, so you benefit even if you do not itemized your tax deductions. Your gift can satisfy all or part of your required minimum distribution. See below for PDF with IRA Instructions. Gifts of appreciated assets such as stock are an excellent way for you to make a charitable gift. From a tax perspective, a gift of appreciated assets makes good sense. You can make the capital gains taxes optional, achieve significant tax savings and support our programs. Please see below for resources for effecting a transfer of assets to our parish, or contact the Advancement Services at the Archdiocese of Los Angeles at 213-637-7341 or AdvancementServices@la-archdiocese.org. Your faithful support of our parish is very much appreciated. Please prayerfully remember our church and help strengthen our presence so that we may faithfully serve our community.